Heat your Belgian waffle iron and grease with oil. In a bowl stir the Bisquick, milk, egg, and oil until blended. Pour onto center of hot waffle iron. Close lid of waffle iron. Bake about 5 minutes or until steaming stops. Carefully remove waffle. Repeat until you have 5 full sized waffles. 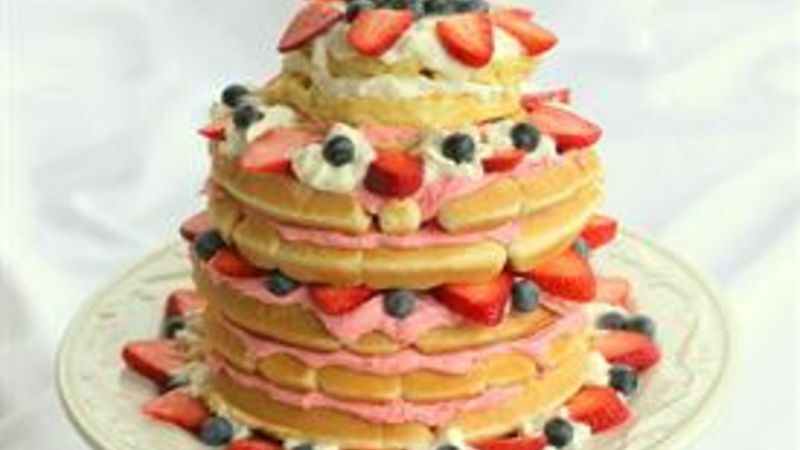 To make the smaller waffles for the second tier of the cake just fill the waffle iron with less batter for a smaller circle. I made 3 smaller waffles but you could make more if you want a taller tier. Place a large waffle on serving plate. Spread some frosting on top of the waffle and add another large waffle. Repeat this until you have your desired height. I added a layer of strawberries here but you can do whatever you like. I then added 2 more large waffles with frosting in between. For the final tier I added 3 smaller waffles with frosting in between the layers. Garnish with strawberries, blueberries, and whipped cream. Serve with syrup if desired. Enjoy!